Mall scavenger hunts can be a lot of fun provided common courtesy is exercised. Remember you will be playing where other people are doing business. Even if your prime objective is to have fun, the store owners want to make money and provide a pleasurable shopping experience for their costumers. In other words, don't be disruptive, rowdy or annoying. Other than that, lace up your shopping shoes and ... HAVE FUN!!! Note: Some malls do not allow you to take photos in the mall. Please check with your mall before planning a mall photo hunt. Get a free Handmade Invitations Ebook, which includes printable templates and ideas for making your own Mall Scavenger Hunt invitations, by clicking here or use our cool printable mall scavenger hunt invitations designed to look like credit cards. A list of items to be found and photos to be taken at ten popular stores referred to in riddle form. Solve the riddles and bring back items from the applicable stores. It's harder than it sounds. Clue: Bring back a container or wrapper from this restaurant known for chicken, but endorsed by cows. Solution: A container with the Chick-fil-A logo on it. Clue: Can you deduce, figure out, speculate or determine the name of this trendy shop and return with an ad or flyer that includes it's famous logo? Solution: An ad or flyer with the Guess logo on it. A fun combination of clues, trivia and requirement make up this mall scavenger hunt list. Take humorous glamor shots, solve mall trivia, and of course... SHOP for specific items. Search and Find: A belt buckle larger than a credit card. Trivia: How many dressing rooms are in Sears? Glamor Shots: Photo of a team member in animal slippers. Low on cash? Still want to plan some fun mall scavenger hunts with your friends? 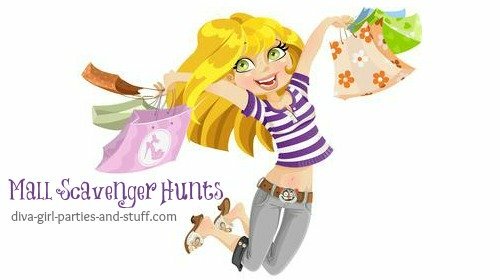 Try our no cash required Mall Scavenger Hunts List. Plan a Mall Photo Scavenger Hunt. Bring your friends, cameras and a few copies of our Mall Photo Scavenger Hunt List. Shopping without cash has never been so fun. If you can't get enough of taking photos at the mall try our second Mall Photo Huntwhich involves photographing team members posing in or with different items available at the mall. Team member modeling a bubblegum machine ring. Team member modeling a shower cap and towel. Team member posing on a colorful couch (sofa/divan). Your mission for this scavenger hunt is to find the lowest price in the mall for specific items. Make your own list or use our printable Best Buy Mall Hunt. Note: Teams do not purchase the items; they just find them and record their finds. Each team should be given a list, a pencil and an eraser. The list provides spaces for recording the name of the store and the price for each item. A pencil and eraser are necessary because teams will more than likely find better prices on certain items as they travel from store to store. Set a time limit and choose a $ penalty ahead of time for teams that come back late. Have the teams tally the total price of all the items on their lists. (If a team was unable to find an item they must write in the highest price of that item recorded by the other teams, plus $1) If there are any questions about the legitimacy of a recorded price, they can be checked out at the applicable stores before declaring a winner. Winning team is the team with the lowest total recorded price. For this hunt each team is allowed to spend $10 total or whatever amount you agree upon beforehand. It is best to keep the amount minimal, since that increases the difficulty of the hunt. The teams must search the mall for items beginning with each letter of the alphabet (26 total) and buy them. They must also bring back a receipt for every item purchased. This is definitely an exercise in creativity. Set a time limit. The winning team is the team who comes back with the most items(only one item per letter). If there is a tie, the winner is the team who spent the least amount of money. Note: You should set a penalty for any team coming back late. Do this before the hunt starts. How much can you buy for $10 these days? You might surprise yourself. This hunt follows the same instructions as the one above. The only difference is that teams must search for items in a particular color instead of items representing the letters of the alphabet. The winning team is the team that brings back the most "pink" items (or whatever colour you choose beforehand). As in the hunt above, receipts are required and you should set a budget and time limit, as well as a penalty for any team coming back late. You can order a printable custom mall clue scavenger hunt with clues for 10-16 stores of your choice HERE.